No. 96 Driver Jeffrey Earnhardt isn’t just racing for the checkered flag this season. 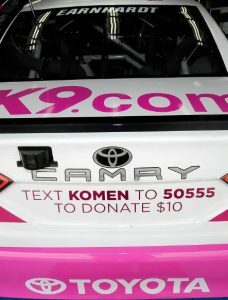 Over the next several Races, beginning with the Monster Energy NASCAR Cup Series Bank of America ROVAL 400, starting at 2 p.m. this Sunday, September 30, Earnhardt will also be joining Susan G. Komen®’s fight to save lives from breast cancer.